Last August, when I took my in-laws to the local farmer’s market, they bought my husband and me a lovely hibiscus, called a “Lady Baltimore,” for our garden. The seller at the market promised that it’s a perennial in this area. I’ll admit to being skeptical at the time. By the end of my in-laws’ visit, though, the plant looked like it wouldn’t even live to make it out of the pot and into the ground. But it did live, and I was delighted when it bloomed several times last August. Although it was a single stalk last year, the seller promised it would grow back more bush-like this year, with multiple stalks. I was just happy when one stalk poked up through the ground this spring and started sprouting leaves and then buds. I’ve spent many mornings since the first sign of green giving it ample water to grow tall and strong. I’m doubly pleased that it came back this year, because I had picked out this variety in particular for its name. One of my favorite aunts – who lived just outside of Baltimore for my entire life – died in March 2010. When I saw the “Lady Baltimore” name on this particular hibiscus, I knew it was the right one for me. It would remind me of my in-laws’ kindness but also remind me of my aunt, who was always interested in what I was doing and always one of my biggest fans. She was one of the people who “watered” me when I was growing up, and she continued to support me in countless ways as an adult – always curious about how my job was going or what new hobbies I had picked up. Any time I saw her, I could always count on her peppering me with questions and listening with genuine interest to my answers. She always had fascinating stories, too, because she approached life with a complete joie de vivre that I have rarely found in anyone else. She traveled. She was a great photographer. She read. She told stories about her high school students, long after she retired from her teaching career. She played golf, tennis and, her favorite, bridge. She visited museums. She went to the opera. She loved dogs. But most especially, she showered her family and friends with unfailing love. To me, she was the Lady Baltimore. 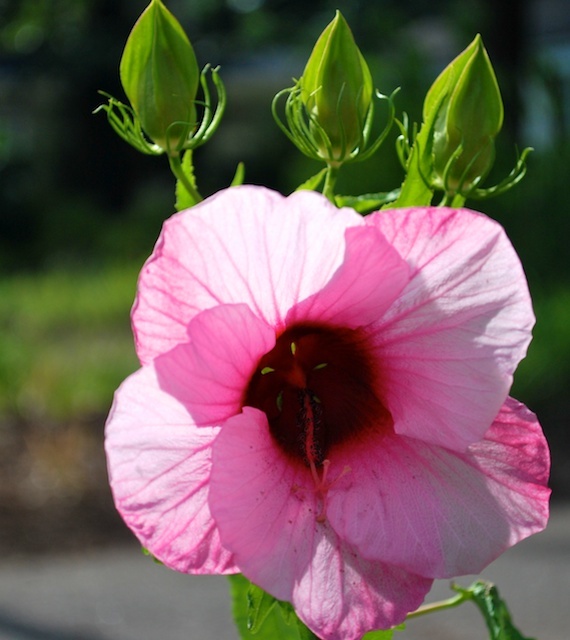 Just like the Lady Baltimore hibiscus needed the right soil and sunlight and water to thrive, we all need the right elements to thrive in our daily lives. You may be wondering what I mean when I talk about my aunt “watering” me. Watering happens when a neighbor stops you on the street and gives you an encouraging word about something you have been working hard on (like my friend Judy did just last week). It may be a phone call or e-mail from a friend you don’t get to talk to often enough, a friend who always leaves you feeling revived and re-energized. It may even simply be a stranger’s smile on a day where nothing seems to have gone your way. God knows when we need watering the most and sends people to cross our paths who will be the encouragement we need, who will lift us up. be anxious in a year of drought nor cease to yield fruit. I quoted this verse in one of my early blog posts and wrote there about places that refresh and renew us. But now I’m adding people to those places. God knows what we need before we do. And he fulfills his promise to refresh those of us who trust in him like a flourishing tree, whether it’s by sending us to a place of beauty, or by nudging a friend to comfort us, or by providing whatever else we need. Are you a waterer, too? I think the golden rule applies to watering. Water others, as others water you. I hope you’ll take some time today to think of someone in your life who could use a little watering — it may take just a little spritz or require a full-on shower. But if God’s nudging you to water someone else, do it now. Don’t put it off. It may be just what that other person needs to feel revived and ready to face tomorrow. This entry was posted in flourishing tree and tagged aunt, hibiscus, Jeremiah, Lady Baltimore, waterers by hopesquires. Bookmark the permalink.